So I made it to the church about 7am. There were people there for the early service and I noticed my friend sugins door was open. I went to his house to see if he was there but his mum told me he had gone away for some family thing in his hometown. I decided to walk to the mamak I know near by. I ordered the normal rotti banana, rotti pisan. For some reason the guy didn't know wat I ment by white coppi so I just got normal coppi. It took a while to come and I ate slowly so by the time I went back to the church it was 7:30. I waited around for a while and talked to some people I know. I ended up chilling with this guy joseph. I didn't know him so well before, I had only seen him a few times before. But we chatted for a while, he was dancing with celine in their performance today. We waited for Janning for a while but then decided to go inside cause the service had started. After the service we worked out Celine and Janning were not comming cause they slept in. I talked to qian and some other of the youth I knew there. Then me and Joseph went to subway for food. We came back to st pauls and there were some more of the youths there. I met celine and benroy. Then shortly after Janning came. 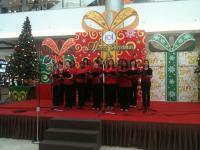 They were doing two performances at different shopping centres. There were some carol performance and some dance performance. We left for the first shop and I watched the performance there. It was actually really great. Then I had a look around for the adidas shop, no luck. But I found the dancers and me and Celine went for more food. Subway again. We headed to the next shop after. It was bigger and better. We had time before they performed to shop. Somehow I decided to buy Celine a birthday present. We got these matching bracelets in the end. They were pretty cool. Their next performance was great too and they got a huge crowd. Afterwards we talked for a while. I met a girl who knew Steven, her name was suan. Then we went back to the church. I said good bye to some people there. And then Janning gave me a lift to the traino. Near the traino was a fast food shop. I went there and got some food and drink before I got the train to kl sentral and then the bus to the airport.